Reprinted with permission from Simple Nature (Rizzoli, 2017). Cut zucchini and eggplant into small dice. Trim ends off asparagus spears. Wash spears and cut into 1/2-inch-thick rounds. Peel pepper with a vegetable peeler, then cut flesh into small pieces. Peel and mince onion. Shell peas. Bring a large saucepan of salted water to a boil, immerse peas for 3 to 4 minutes and shock them immediately in ice water. Drain and set aside in a deep bowl. Heat a little olive oil in a small frying pan, brown zucchini and add to bowl with peas. Put a little more oil in frying pan and cook in the same way and in the following order the eggplant, asparagus, mushroom and onion. To make the clafoutis batter, heat oven to 350 degrees. Break eggs into bowl. Beat lightly with a fork then add flour, crème fraîche, and half the almond meal (2 7/8 ounces, or 3/4 cup plus 2 tablespoons). Mix. Pluck basil, mint and cilantro and use scissors to coarsely cut leaves. Add herbs to bowl with vegetables and mix to combine. Spread clafoutis batter over base of a gratin dish and sprinkle with remaining almond meal. Spread vegetables evenly in dish. Bake about 40 minutes. 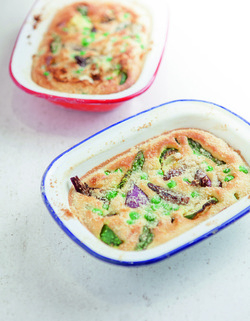 Serve immediately in gratin dish.